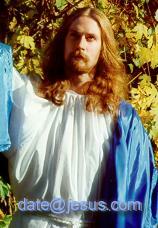 Description Golden-haired, blue-eyed Jesus seeks loving young woman (22-30), preferably of recent Norse-Germanic heritage, who wishes to live in the spirit of the eternal. Innocence, or rebirth into innocence, and a desire to transcend the material mendacity of this world are essential! I offer a pure and spiritual existence of life's essence, free of fear, free of despair. I will reveal the bliss, power, and endless rewards of faith and belief. The right woman who is ready for my love, blessings, and unforgettable spiritual exploration will be given the world, but will also want to give me her world in the mutual quest to share the infinite. I offer you the ability to experience the fulfillment of your dreams and all you seek. Prospective respondents should read 1 John 4:18. True to artistic depictions, I have a lean swimmer's body and a six-pack, and if you have sought your best in life you will also be in good shape. Please note: This is a legitimate ad. I am highly spiritual, though not religious, and have often been called Jesus because of my appearance and powerful spirituality that I attempt to share with others. If you live in the DC metro area and are seeking a loving, trusting relationship founded on the mutual search for meaning in life as well as the desire to share deep romance and limitless passion, please reply with a description of yourself and a photo. This journey spans not only spirituality but also uncovers our place in the context of the peak moments expressed in culture, art, philosophy, and historical events. Dynamic, eclectic, curious, confident, intelligent, attractive, faithful and brave women are desired. Musicians and artists especially favored. Characteristics Honest, intelligent, creative, responsible, humorous, financially & emotionally secure, energetic, positive.